Does an overtly low-budget game in which a controversial politician smacks down black and gay people count as "straight up trolling" by Valve's new anything-goes standards? Is it an effort to "incite and sow discord" — which Valve also recently said can be disqualifying? These are the questions surrounding Bolsomito 2K18, a game that's now being investigated by the Brazilian government. Jair Bolsonaro is a Brazilian politician who's promised to crack down on widespread corruption, but who's also made a slew of racist, sexist, and homophobic statements and been known to wax nostalgic about the country's 1964-1985 military dictatorship. He is, because it's 2018, within spitting distance of the presidency. Most recently, in the days following his first-round presidential vote victory, protesters have taken to the streets, shouting things like "dictatorship never again." Bolsonaro is the main character of a crudely-made Steam game called Bolsomito 2K18, in which players guide Bolsonaro as he ruthlessly punches and stomps foes that include black protesters, LGBTQ people, and political rivals. "Defeat the communistic evils in this disrespectful game and be the hero that will free the nation from misery," reads the game's description. "Be prepared to face many kinds of enemies that intend to establish a criminal ideological dictatorship in the country. A lot of brawl and good laughs." The game, released on October 5, has been controversial. Its reviews — many of which centre around patriotism, hatred of the media, and sticking it to those mean old SJWs — currently average out to a "very positive" score by Steam's metrics, but the far-and-away most upvoted review is a lengthy attempt at putting Bolsonaro's rise in perspective. "This game is an obvious incitation of violence against black, women, LGBT, and left-wing people and a glorification of a tyrant, crooked, nazi-like scumbag," it reads. "Try to imagine a game where you can play as Hitler, Stalin, Pol Pot, Mubutu, Idi Amin Dada, Saddam Hussein or Muammar al-Qaddafi, or even Donald Trump, and your role is mass killing people and political enemies? This is Bolsomito 2K18." 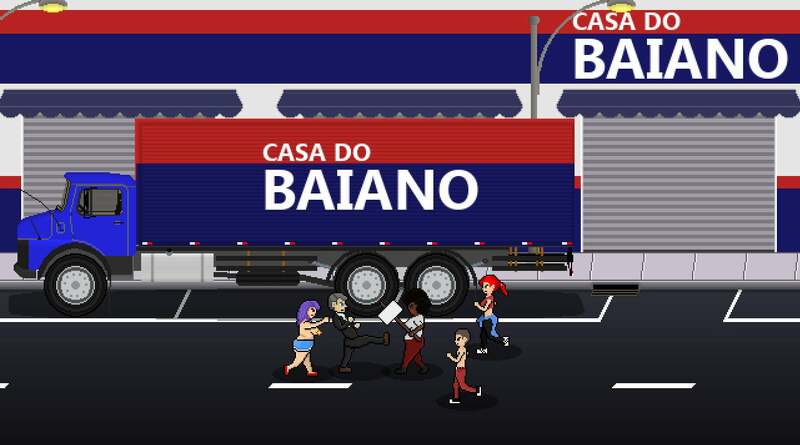 This controversy — combined with the game's release just days ahead of the first leg of the Brazilian election — caused Brazil's Public Ministry of the Federal District and Territories (or the MPDFT, for short) to open an investigation into Bolsomito 2K18. The game, according to the MPDFT's document (as translated by Eurogamer) "clearly intends to harm [the] Presidency of the Republic and thereby embarrass the 2018 elections" and "cause collective moral damages to the movements social, gays, and feminists." The document concludes with a call for Valve to remove the game from Steam and to identify the people responsible for it. Can a dinky little game single-handedly shame an election or cause measurable harm to vulnerable groups of marginalised people? Of course not. But it's one more spark in a political field full of powder kegs, and Valve has, in the past, taken heaps of flack for letting hate groups set up shop on Steam. These things add up, providing safe havens for views that centre around doing harm to others — often those in marginalised groups — simply for who they are. The more people feel safe in expressing these ideas, the more likely they are to act on them. This is the concern lying at the heart of questions surrounding games like Bolsomito 2K18, as well as the role of platforms like Facebook, Twitter, YouTube, Twitch, and Steam in cleaning up hate speech. Valve announced its new anything-goes policy just a week after Steam was rocked by a similar controversy surrounding a game that glorified school shootings. Valve removed that game, but in its subsequent new policy announcement, told people to expect to see more games they "don't think should exist." "There will be people throughout the Steam community who hate your games, and hope you fail to find an audience, and there will be people here at Valve who feel exactly the same way," Valve wrote in reference to a hypothetical offensive game. "However, offending someone shouldn't take away your game's voice. We believe you should be able to express yourself like everyone else, and to find others who want to play your game. But that's it." Kotaku reached out to Valve to find out how it intends to handle this situation, but as of publishing, the company had yet to reply. If it's defamatory, it's against Steam's terms. I don't know if it is or not, just that illegal stuff is a clear line they draw. Politics get more petty year in year out. I guess if having a game where you can punch nazis is kinda similar to one where you can punch SJWs. If you automatically make the connection that both parties are the complete representation of both sides, sure. But in reality both arguments are a load of crap. Because Nazis who murdered millions are totally equivalent to the outrage crowd. Given some of the vile stuff Jair Bolsonaro has spouted (Im not joking. This stuff makes trump look tame) its not suprise a game like this would be created. "Try to imagine a game where you can play as Hitler, Stalin, Pol Pot, Mubutu, Idi Amin Dada, Saddam Hussein or Muammar al-Qaddafi, or even Donald Trump, and your role is mass killing people and political enemies?" Sorry, but the inclusion of Trump's name in that list, in light of the rest of the list, seems wildly inappropriate. Trump is no saint by any stretch of the imagination, but that list is some pretty vicious individuals (only missing Mao to be a who's who of 20th century sociopathic dictators) and the inclusion of his name in that list instantly paints the rest of his review in a pretty questionable light in my eyes. Nah. Trump's name is appropriate. He's only being stoped by democratic mechanisms and active undermining by his own staff. Or you know. They had the "or even" part to separate him from the others. Like it or not, He is a polarising figure and its appropriate to include him. There is also the fact that Bolsonaro has been repeatedly compared to Bolsonaro often being called "Brazils Bolsonaro" or "A worse version of trump"
I think you inflicted your own latent bias on the sentence resulting in you painting it in a different light. Had they been wanting to do what you think they did. They would have done "..... and Donald Trump". But having it as "or even Donald Trump" is intentionally separating the two.